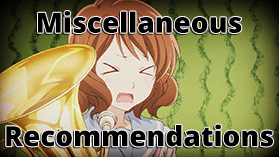 I’ve been saying that I would review food for a while now. This is close enough, right? Ramune (ラムネ, pronounced rah-moon-ay) is a Japanese soda best known for its unique bottle. Rather than a plastic twist cap or typical beer bottle cap, Ramune uses a Codd-neck bottle, where a marble is used to close the opening. There are two ways to open a bottle of Ramune. 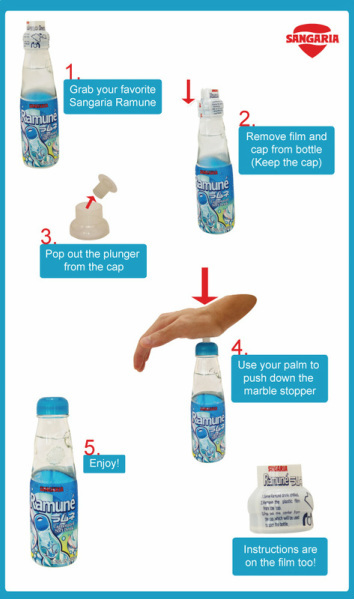 The first is to follow the directions on the bottle – remove the cap, separate the small plunger, and press the plunger into the marble until it pops in. 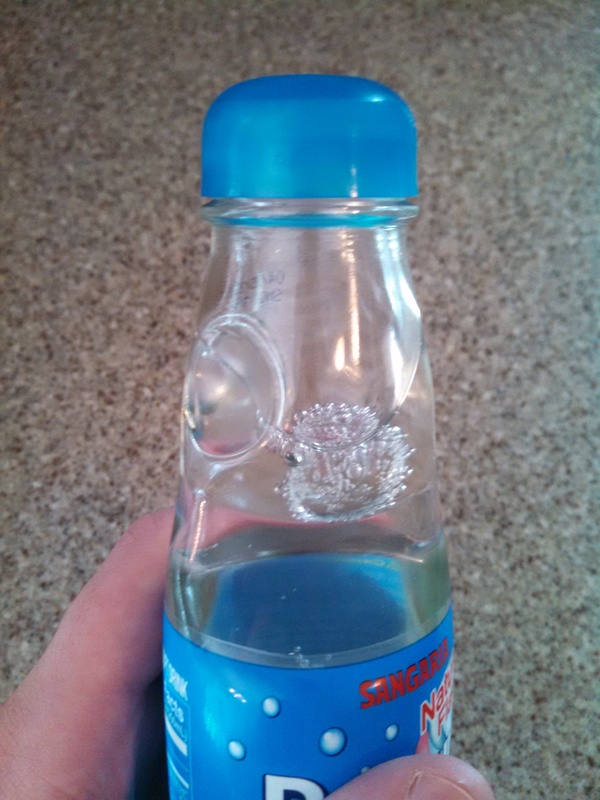 However, the proper way to enjoy Ramune is “yakuza-style.” First, shake the bottle. Second, slam the plunger into the marble as hard as possible. Third, chug it. Here’s a video demonstration of drinking Ramune yakuza-style (no, this isn’t me). When drinking from the bottle, the marble remains in the top section. To prevent this from rolling into the opening and blocking the flow of soda, there are two small indentations meant to hold the marble in place. Unfortunately, it can still slide around easily if the drinker tips the bottle quickly. While Ramune flavors include oddities such as coconut, octopus, chocolate, and watermelon, my local Wegmans only has three flavors – “original,” orange, and strawberry – so I will cover those today. The original flavor is a lemon-lime, but not quite comparable to sodas such as Sprite or Sierra Mist. The flavor is a bit more fruity and uses real sugar in lieu of high fructose corn syrup, which is a definite plus. The strongest of the bunch is the orange flavor. While it doesn’t taste much different than typical orange soda, it is very tasty and refreshing. Out of these flavors, it is the one I would recommend most. The strawberry flavor has a very faithful and fruity strawberry taste. It is also a bit sweeter than the other two, and seems better suited for a hot summer day. Unfortunately, the strong carbonation works against the sweet strawberry flavor, so this one isn’t quite as good as the other two. In the United States or other western countries, Asian markets or certain grocery stores have a decent chance of having the drink in stock. In Japan, while drinks such as Pocari Sweat and Gogo no Kōcha are all over the place, Ramune is not available in any vending machines I saw – the main reason for this would likely be its bottle. However, it is available at many festivals (I saw them at a Tanabata festival) and in certain stores. Altogether, Ramune is worth it for the occasional treat, but the deceptively small bottle is not quite worth the asking price. At my local grocery store, a 6.76 ounce/200 mL bottle is 1.79 USD. I could get a two-liter bottle of Dr. Pepper for that price. More or less. Recommendation – For a soft drink a bit outside the norm, try it! While flavor variety won’t be anything unique outside of Japan, Ramune is certainly worth trying at least once. At its core, it is just another soda, but it’s different enough to warrant a taste. I wonder what the chocolate one is like. I’ll pass on the octopus. I think the curry one sounds the most interesting. Curry bread is weird enough, I can’t imagine that flavor in a drink.